Hello Monday! I hope you had a great weekend? I read recently that people's living spaces are getting smaller. People around the world are downsizing to save money, live greener and well....because they've realised that small can be beautiful too. 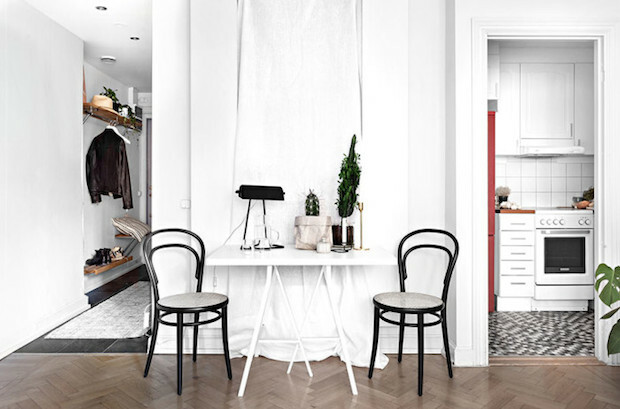 And this home in Stockholm's Södermalm district is a prime example. Measuring a mere 29 metres square (312 square foot) it's comfortable and practical (double bed - check! Sitting room - check! 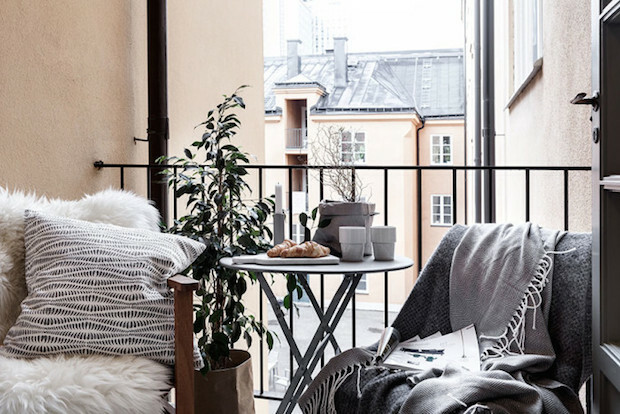 reading corner, dining room, balcony for two - check, check, check! 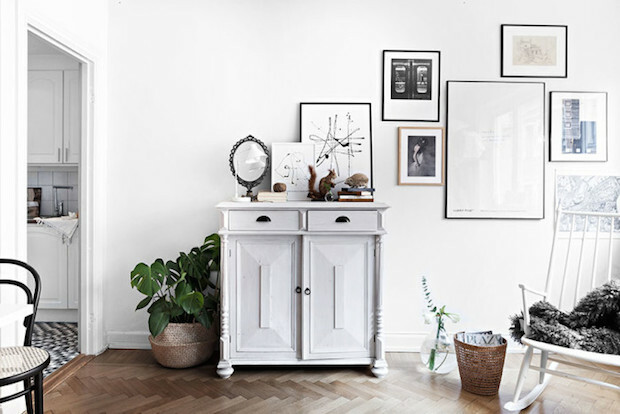 And, decorated throughout in grey-scale with the fainstest touch of pastels - and an eclectic mix of mid-century, new nordic and designer pieces - it looks beautiful too. Could you live here? 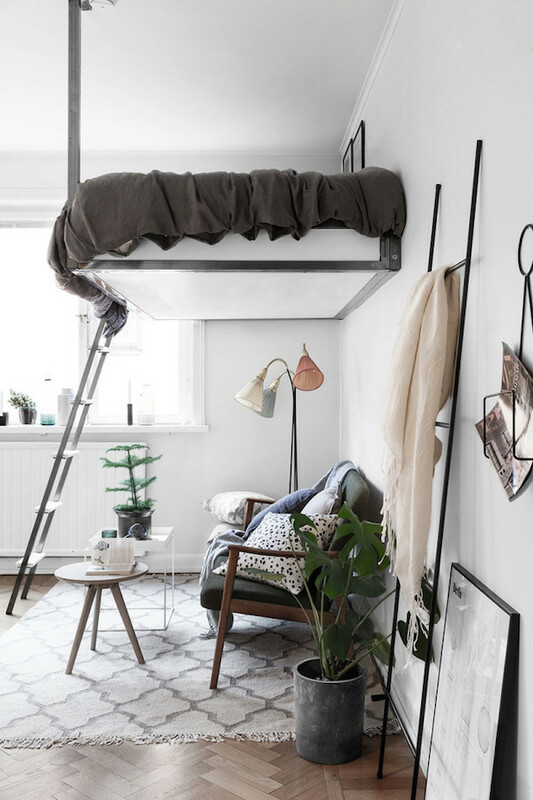 I think it looks so calm and cosy - a little oasis in the heart of Sweden's capital city.But more importantly, could you sleep high up in that double bed?! 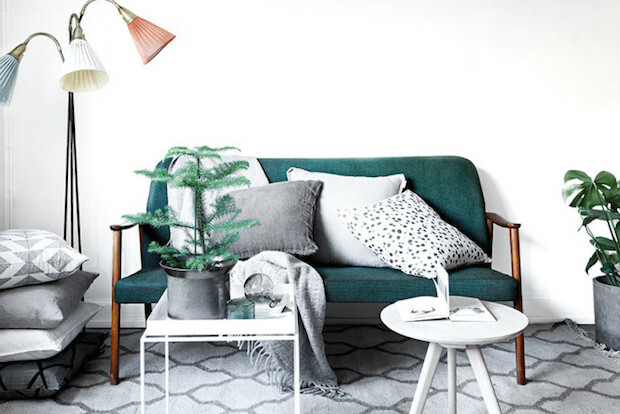 Get the look: seagrass basket, Hay tray table, Copenhague coffee table, I love this mid-century style sofa, dark grey bed linen, Berlin print, Thonet chairs (15% discount with code MYSCAN), white sheepskin throw. 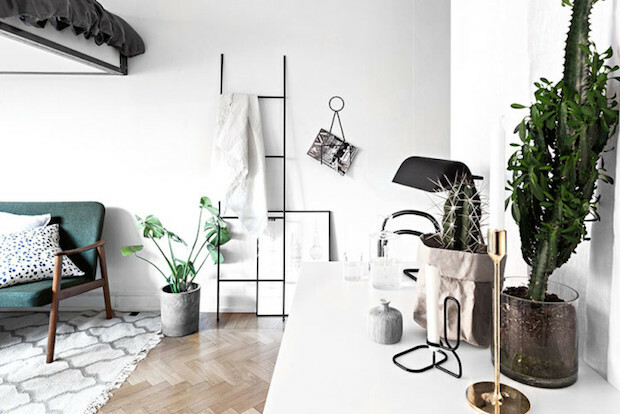 If you're looking for more small space ideas I've got a week's worth of coffee break inspiration squirrelled away here! Do you live in a small space - or perhaps looking to downsize? PS My family and I are going on holiday to Sri Lanka next month ( I can't wait! We didn't go anywhere last year since I was working on my book so we've been so looking forward to it!). I was wondering if you have any great tips on places to stay (we love small, relaxed, personal places as oppose to big hotels) and things to do? Thank you so much for any tips you may have! So cosy! Sofa is beautiful. The sofa is particularly lovely isn't it? Very bad idea to put bad on top of the ceilings. Fold out sofas are definitely a good option for a small space. I agree about the bed. I always wonder if I'm the only one worried about rolling out of one of those loft beds in the middle of the night!! My husband and I are going to Sri Lanka in March! So excited to see what tips appear here so we can take advantage of them as well :) Have a wonderful vacation! How exciting! Your first time too? We're planning on hanging out on the south coast and going to Ella for a couple of nights too, I can't wait! Let's hope some great tips come up for us both! a great idea and a lovely home - but sleeping up high like that would scare me. Have a great trip. I have never been and expect it will be fabulous. It does look quite high doesn't it?! Thank you so much for all these tips Sarah - wonderful! (and for checking my blog almost every day - happy to hear!). Hi Faith - so lovely to hear from you! Re the bed - thank goodness you realised in time....! Would love to meet for a coffee soon - are you around this week? 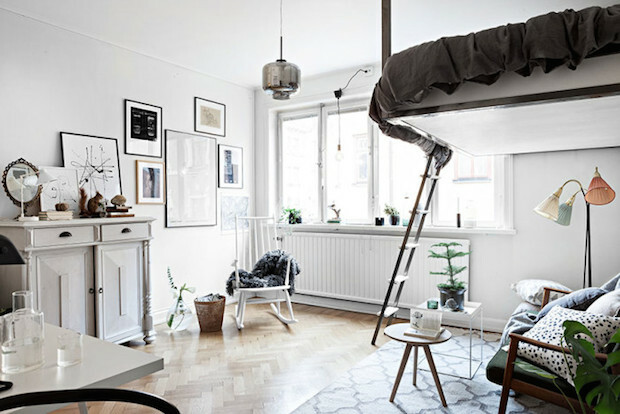 This space is really inspiring, it is small but feels bright and airy. 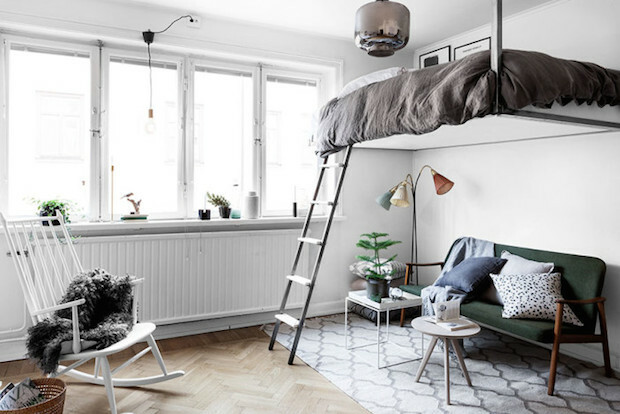 I think the bed is a great idea, especially since it hangs from the ceiling unlike bunk beds. It feels less cluttered. However, I think it is better for short time stays as climbing a ladder everyday to go to bed and being unable to stand up can be annoying in the long run.